March 20th, 2017 would be forever remembered as an important day for Indian telecom industry, because on that day, Idea Cellular officially merged with Vodafone, to create India’s largest and World’s 2nd largest telecom company, only after China Mobile. Vodafone had confirmed the merger in January this year. The new entity, which is valued at Rs 1.55 lakh crore, has now 400 million customers, which is more than Airtel, Jio or BSNL, and with 1850 MHz, the company has access to more spectrum than any other telecom company in the world, besides China Mobile. In comparison, Airtel has 270 million users while Jio has 100+ million subscribers. The Idea-Vodafone merger will now have a combined revenue of Rs 80,000 crore, commanding around 41 percent revenue share in the market. In terms of subscribers’ count, it would command 35% market share. Before the merger, Vodafone India was #2 biggest Indian telco, and Idea was #3 biggest player. Now, Idea and Vodafone will now collectively command a massive 40% market share of Indian telecom industry, thereby becoming the #1 player in this competitive market. Comparably, Airtel commands 32% market share currently. Kumar Birla has been announced as the Chairman of this new entity, while CFO would be decided by Vodafone. All legal and operational nuances of this blockbuster merger would be over by 2018, and both Idea and Vodafone will jointly announce the new CEO and Operations Head of the company. At the time of the merger, Idea’s Enterprise value was pegged at Rs 72,200 crore while Vodafone India was valued at Rs 82,800 crore. You can check out the video giving more details on Vodafone-Idea Cellular Merger. 3 Better Quality Of Services? In the short term, we may witness even more competitive price war related to mainly data tariffs. As the merged entity now commands 40% market share, a single drop in per GB pricing will force Airtel, Jio, RComm and BSNL to respond, and we may witness even cheaper tariffs in the coming days. But in the longer run, analysts are predicting a market correction of telecom pricing, and in the next 6-8 months, we may see telecom players ganging up to jack up the prices of all telecom services. With only 5 major players left now: Airtel, Idea-Vodafone, Jio, BSNL and RCom (which has merged Aircel, bought Telenor, and may merge with Tata), pricing of telecom services would be a factor which can be negotiated easily now. If we talk about the telecom market, then it is good for the industry as a whole. Current debt of the merged entity stands at Rs 1.07 lakh crore, and Idea has already announced that they would be saving close to Rs 14,000 crore per year, due to combined operations and sharing of infrastructure usage. Less debt means the telecom companies can now focus more on the improving in improving existing infrastructure, which means better network for all. Buzz is already in that the combined entity will start firing in a massive scale, and Chairman of the new entity, KM Birla, has already hinted towards it. When the main objective of both the telecom firms is to reduce debt via merger, then layoffs can be pretty much expected. Although Vodafone CEO hasn’t hinted towards layoffs, but analysts are predicting that 5-10% of the workforce from the combined entity may be asked to leave in the next 12 months. What are your views on this blockbuster merger and consolidation in Indian telecom sector? Will it translate into good news or bad news for the end users? 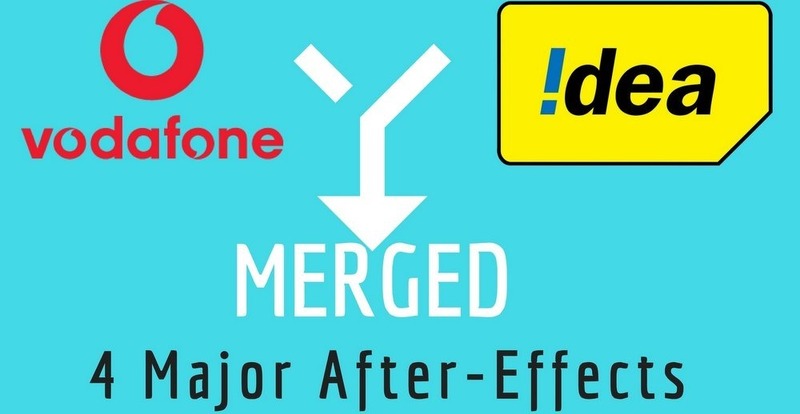 Do let us know by commenting right here..
"Vodafone-Idea Merger: 4 Major After-Effects You May Witness! ", 2 out of 5 based on 3 ratings.